Hood is also chairman of the board at the John Locke Foundation, a North Carolina think tank that issues reports, hosts events, produces broadcast programs, and publishes Carolina Journal, which serves a monthly audience of more than half a million North Carolinians through its print, radio, and online editions as well as its news service for local newspapers. Hood helped found JLF in 1989 and served as its president from 1995 to 2014. Since 1986, Hood has written a syndicated column on politics and public policy for North Carolina newspapers. It currently appears regularly in the Winston-Salem Journal, Greensboro News & Record, Asheville Citizen-Times, Wilmington Star-News, and newspapers in 70 other communities. 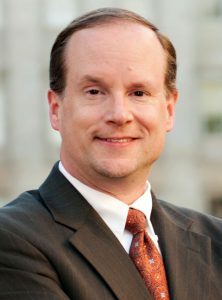 He also writes a regular column, “Free & Clear,” for Business North Carolina magazine and serves as a weekly panelist on “NC SPIN,” a political talk show broadcast on 26 television and radio stations across the state. At JLF, Hood created the E.A. Morris Fellowship for Emerging Leaders, a yearlong program that prepares young North Carolinians for leadership roles in business, government, and nonprofits. He also serves on the faculty and board of directors at the N.C. Institute of Political Leadership; on the boards of the State Policy Network, the Student Free Press Association, and the James G. Martin Center for Academic Renewal; as co-chair of the North Carolina Leadership Forum; and as a member of the North Carolina Commission on the Administration of Law & Justice.